Summer in one shoe with these sandal espadrilles, I love the huge wedge and the embossed detailing on the upper. These are the sandals that will make your summer look, with their Michael Kors attention to detail and stylish finish. 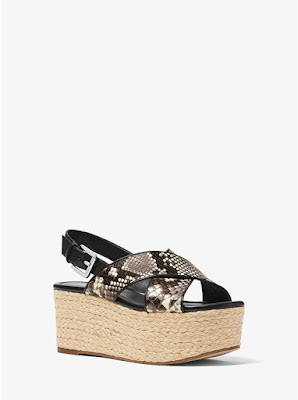 Set on a jute platform, the Jodi wedge is effortlessly chic. Snake-embossed leather straps and polished hardware refine this bohemian style, rendering them the perfect complement to breezy dresses and cropped denim.